In recent years, the standard way of constructing new cruise ships is to make several of the same design, thus reducing the cost of creating and implementing different designs. 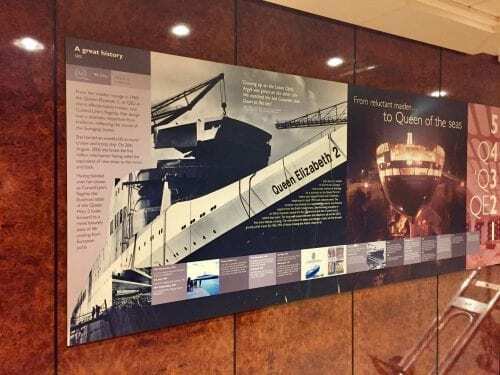 The Queen Mary 2 — the flagship of Cunard Lines — does so and with justification. For one thing, she defines herself as an “ocean liner” which means she sails a regularly scheduled route between points A and B and that she is constructed with a deeper keel and thicker sideplates to withstand rough ocean seas. The library on the QM2 is quite large and has several reading areas. She offers the largest dance floor at sea, in the Queen’s Room, with its own orchestra and featured singer. In addition to those two large rooms, the QM 2 has a full-sized theater with its own orchestra. 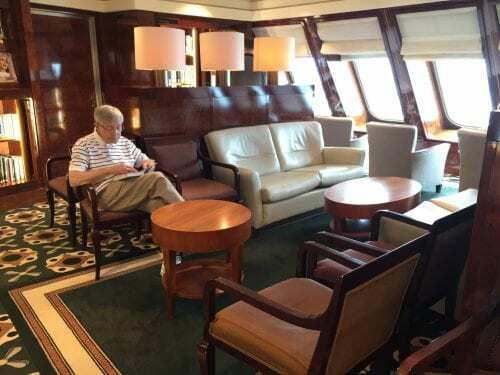 She has what is probably the largest library at sea, with several areas for quiet reading. There is a bookstore attached which sells a wide variety of items, including MOVA globes. Another unique feature is the Golden Lion Pub which serves a full pub lunch daily at no extracharge. Chet had the fish and chips and I went for the Ploughman’s platter. She has the only kennels at sea, which accommodate dogs and cats on transatlantic crossings. 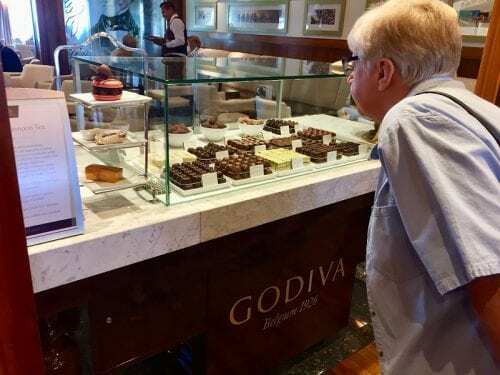 The specialty coffee shops feature Godiva chocolates and desserts. When she was constructed in 2004, she was the longest liner ever built (100 feet longer than the S. S. France), and she held that title until she was surpassed by RCCL’s Oasis of the Seas which now has been surpassed other ships. In Cunard’s earlier days, its ships offered several classes of service and they still do. 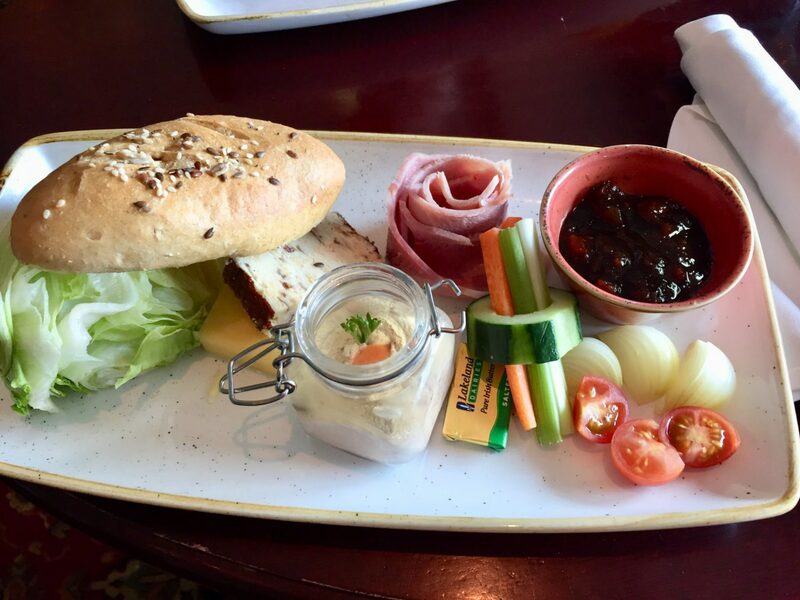 Today there are four levels, defined by the private restaurants assigned to each: The Queens Grill, the Princess Grill, the Brittania Club and Brittania. Each level has its own privileges. They offer classes in fencing. Their spas and fitness centers are run by Canyon Ranch. A SpaClub with thermal pool is featured on this ship. Their Clarendon art galleries are very elegant and discreet. They do not hold noisy auctions but they definitely do make sales. You make very good points. Most of these features can be enjoyed by passengers, regardless of the stateroom category they booked.